How useful can feedback be? For one thing, by learning how to provide effective feedback, people are able to easily point out the things that are being done right and the things that need to be worked on. Understanding that, feedback is an essential tool that can help just about anyone and help them reach success. This being the reason why those with authority have to learn to give feedback, due to the fact that whatever information they hand out could determine whether the receiver is able to achieve certain goals or fail to reach any of them. So whether you’re giving or receiving, one must know that quality feedback could be the difference between success and failure. No matter what, feedback will always be available to hand out. If you’re working in a company and you ask someone when feedback usually occurs, the most likely response would be during employee surveys, performance reviews, or even training evaluations. Feedback can be handed out at any time whenever you might need it. Let’s say that you were able to help your customer out in picking a product, then customer then tells you that you did a good job in terms of assistance. That right there is already feedback that you can benefit from. It can help motivate people. If you ask people about what they think about how you’re handling the business or how you’re performing, then it makes them feel like you value and appreciate whatever opinion or suggestion they have. With this in mind, it will also be more likely that they’ll be handing out even more feedback. By letting them know that they have some sort of say in whatever business decision you make, it’ll help foster a sort of relationship with them, something that can help ensure that you only get honest and useful feedback from these people. It’s a tool that’s used for continued learning. So long as you take the time to go and ask others questions regarding their experience working with your company, then it’ll give you an idea as to how the business is running. It’ll tell you whether the business is achieving its goals, whether these employees are hitting their targets, if your products and services need any changing or improvement and much more. Feedback will help you make all of the important business decisions that could very well put your business ahead of the rest of the competition. Try to ask feedback from others. As a manager of a company, you’ll want to understand that how these employees feel about you will tell you if you’re doing a good job in terms of management. So it’s best to ask your colleagues regarding what they think about your management style. If you’re brave enough, then you can ask them if they’ve heard anyone else talking about how you’re running management. You’ll need to branch out to those you think can give you their honest opinion so that you’ll know the things that you’re doing ring and the things that you’re doing right. You’ll need to avoid any kind of defensive reaction. While this may be obvious, but any kind of negative reaction will just end up with employees being hesitant in giving you feedback. No matter how frustrated you are with the employee, even if the employee has no idea with what’s going on, you’ll need to remember the situation where that person doesn’t have the perspective that you do. So remember to just stay calm and listen carefully to whatever feedback your employee gives you and act in a professional manner. Remember to own up to any shortcomings that you may have. If you know that you’ve made a bunch of errors here and there that have affected your employees, then you’ll need to own up to it and apologize. Doing this will show these employees that you’re handling things in a professional manner. This will then pave the path that will allow them to communicate with you in a more open manner, making them give you their support and telling you what you need to know. By owning up to whatever you did wrong, employees will more likely tell you if you’re making that same mistake or if you’ve made new ones. It’ll help prevent you from being one of that manager that drives employees away, and it will help you fix things that need serious improvement. Show interest and genuine interest in how your employees are doing, what problems they’re having and how you’re going to solve them. By asking them questions that gauge their productivity, environment and their workload, you’re creating a culture of open communication where your employees can give you information based on how they think and feel. This will also help you determine where you should give most of your support and how you’re going to give it. You can even ask questions about their performance and ask them what you can do help make sure that they perform better. So long as these requests aren’t unreasonable, then you may just be able to help them out. You’ll need to pay attention to any nonverbal behavior that shows frustration or distrust. Whenever you have a meeting with your employees, take a good look around. Do you see anyone who’s gaze isn’t fixed on you during the meeting? If so, then these reactions may be appropriate during certain situations such as calling out an employee for not meeting company expectations. If this happens regularly, you’re going to have to dig deeper and ask questions that will help you better understand why these employees reacted this way. Because if you don’t understand the reason, then you can’t address the problem. Make sure that the receiver of the feedback feels comfortable. Those that receive feedback and feel as if they’re too pressured or uncomfortable often tend to forget or ignore any of the information that they’re given. So try to create an air of safety that will tell the receiver that the feedback is meant to help rather than just criticize. Shower the receiver of the feedback with praise whenever you can. Let’s say that you have to appraise an employee’s performance and you’ve seen that he or she has gone beyond company expectations. Don’t be afraid to show that person that you appreciate the effort. This could spark motivation and could possibly improve performance and productivity if done right. So remember to praise the receiver of the feedback whenever you can. You must be specific when handing out feedback. Whether you’re pointing out what was done right or wrong, you’ll need to provide specific details so that the receiver of the feedback can better understand. By being specific, the receiver will know what he or she needs to do to improve, and what problems need to be fixed as soon as possible in order to reach certain goals and success. Be timely when providing feedback. You’ll want to hand it out as soon as possible especially if the that person has just recently did something that should be given feedback on. If you wait too long to provide this person with feedback, there’s a huge chance that certain parts of that persons’ memory may have forgotten about what he or she did. This ultimately makes feedback useless so be sure to give feedback as early as you can. Always remember to keep your emotions in check. If an employee has frustrated you due to a mistake that was made, try to keep calm and ask the employee’s perspective on what happened. Do not give in to anger or any other emotion as you may end up saying something that you might possibly regret. You must then point out the problem the receiver of the feedback is experiencing and ask whether or not he or she understands. Remember to stay professional and discuss what you expect from this person. Employee Feedback Form. This is the type of form that is made use by just about every single company and organization. 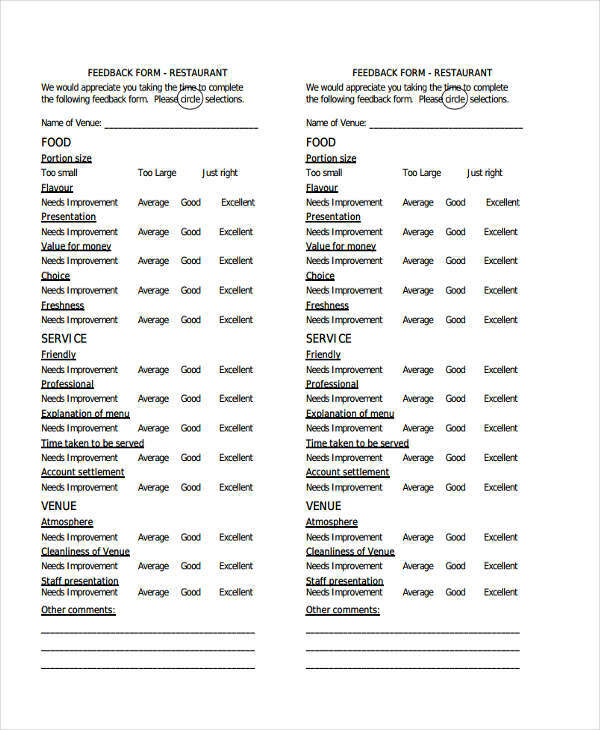 With employee feedback forms, businesses are able to see how their employees feel regarding their work environment, management, workload and more. By gaining such important information, those with authority within the business can make the important decisions that could improve employee satisfaction, as well as ensuring that their productivity and performance goes up by listening to their opinions, suggestions, and concerns. 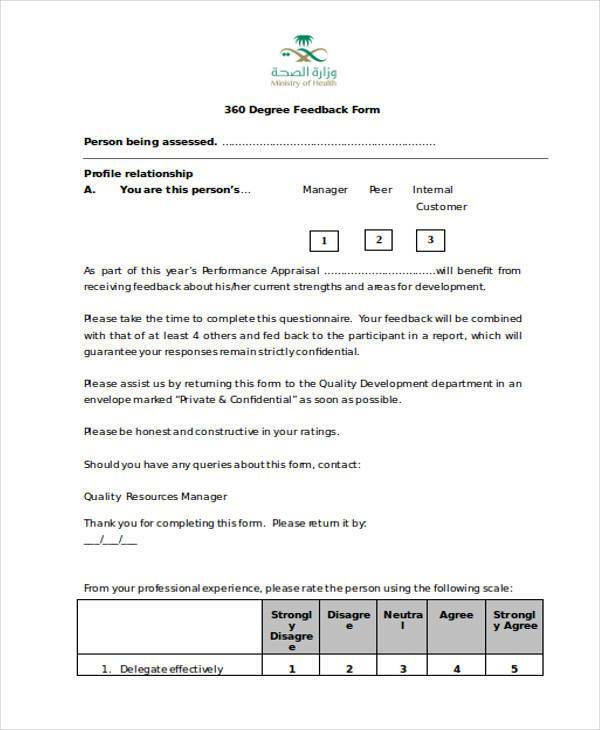 360 Degree Feedback Form. 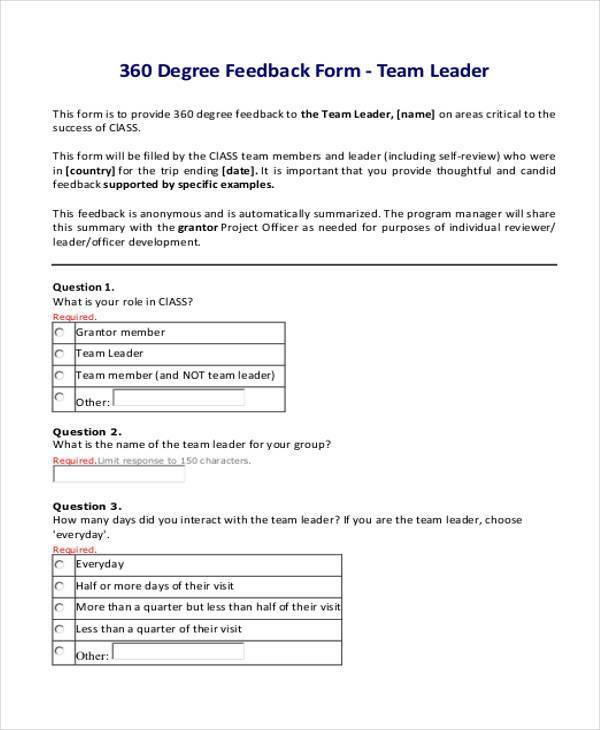 360 degree feedback forms can be used by every employee in a business. 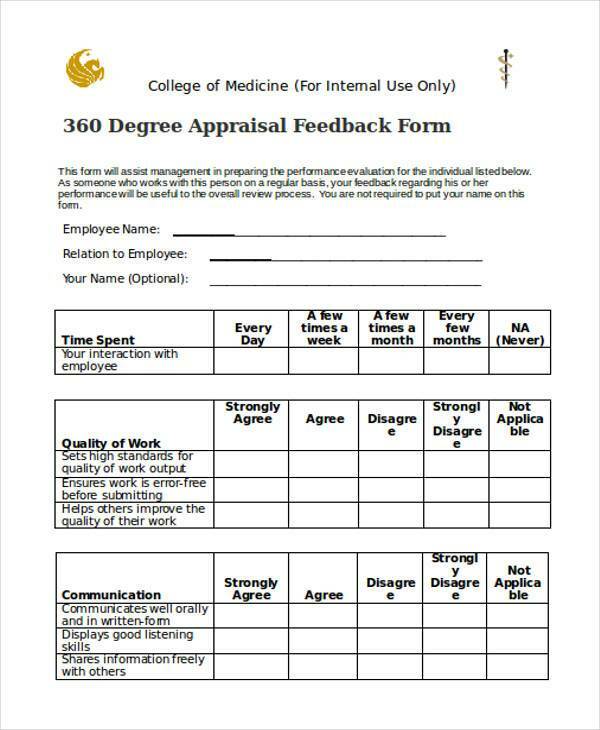 With this particular form, 360 degree feedback sessions are made much easier as employees are able to gather valuable information regarding how their peers feel about them. This gives employees a many different sources of information that can tell them how they’re performing and what problems they currently have that they should fix. However, one must remember that not all information gained from 360 degree feedback is useful as some may tend to be biased or some employees may have issues against another employee which these people may tend to hand out false feedback. 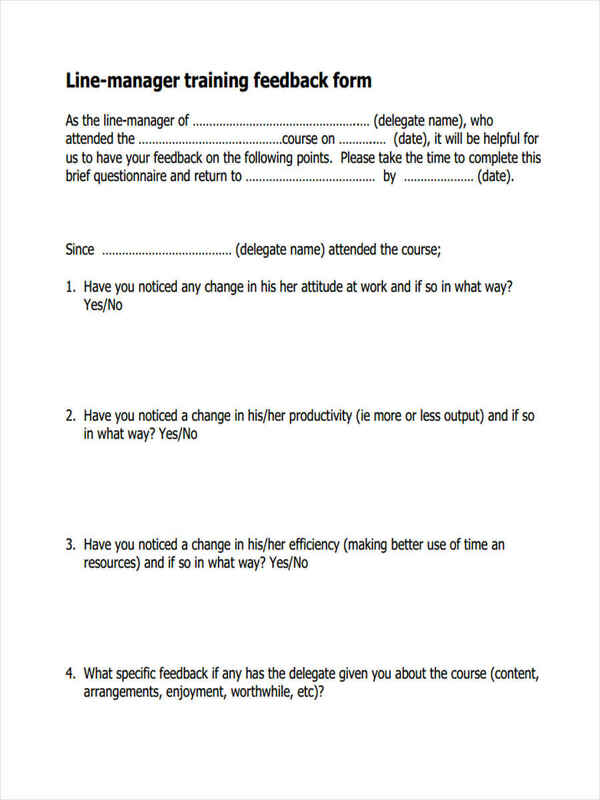 Induction Feedback Form. The induction process is something that every new employee has to go through. Company management has to put new employees through this process so that they may learn all about the new environment that they will be working in and to help them get used to it. 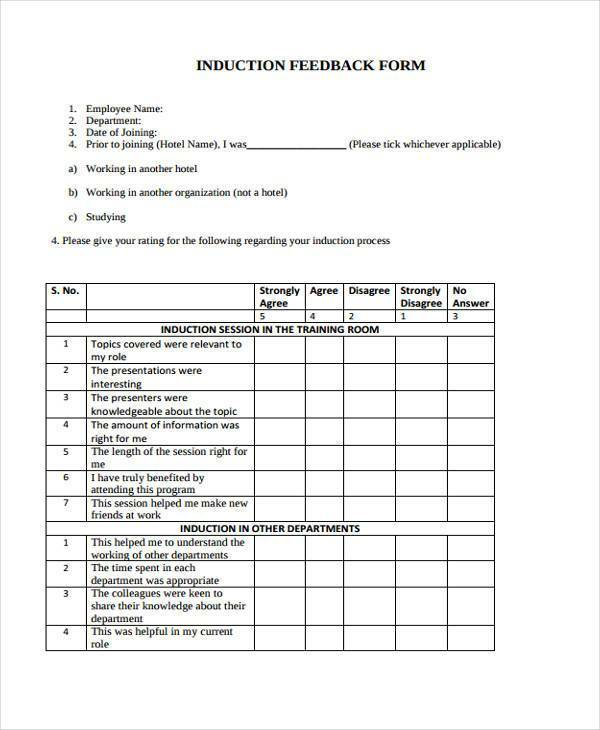 So once these new employees have gone through the induction process, they may then utilize the induction feedback forms to point out its ups and downs. For example, the employee could comment about a problem on how his or her new coworkers were not able to give a proper welcome on the first day. This information can then be used by management to correct these problems so that future employees will have a much better induction experience. 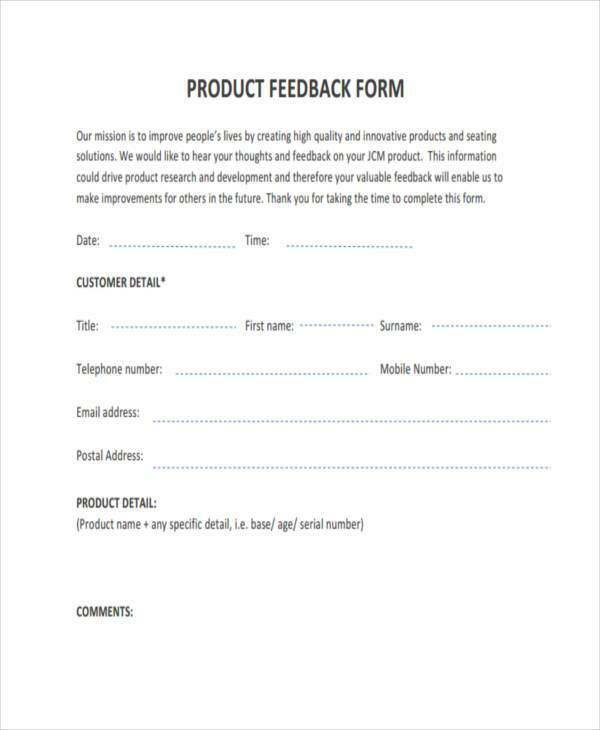 Product Feedback Form. This is what every customer makes use of in the event that they would like to provide information on what they think about a product they have purchased. 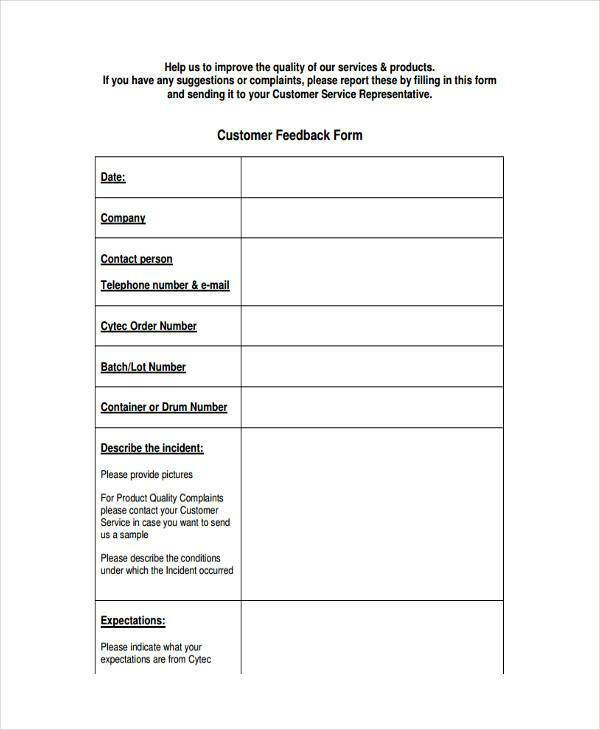 Product feedback forms allow customers to show if the product was satisfactory and met their wants and needs, or if the product had one or more problems that prevented the customer from enjoying it. Some of these problems include the product being lower in quality compared to its advertisement, the product having too many defects, or it could be something as simple as customers not being happy with how the product looks. Businesses can also use these forms for when they receive products from their suppliers. 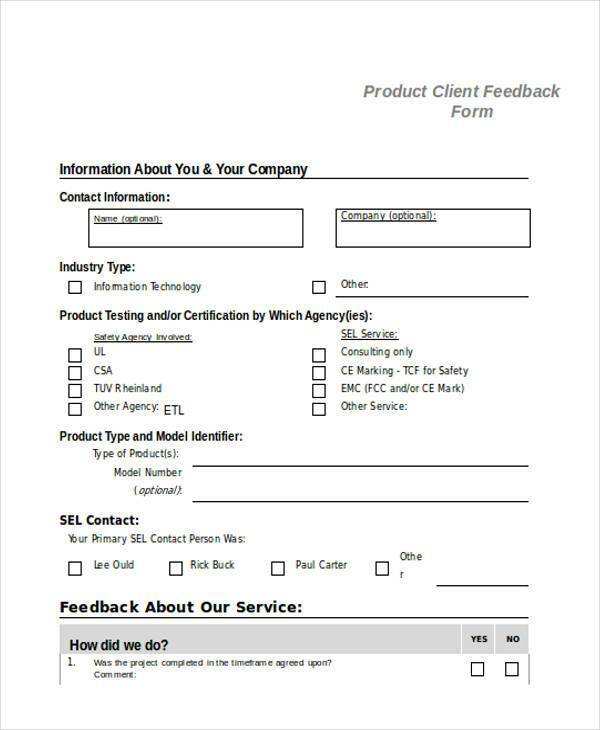 So if you’ve ever bought a product that failed to meet your expectation, be sure to fill up these forms and send it over to management. 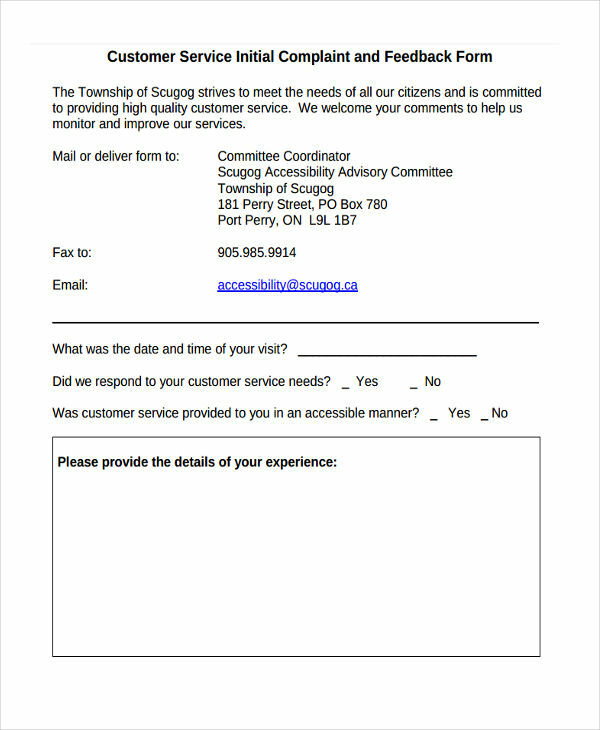 Customer Feedback Form. This is the form that every business needs to utilize if they want to reach success. 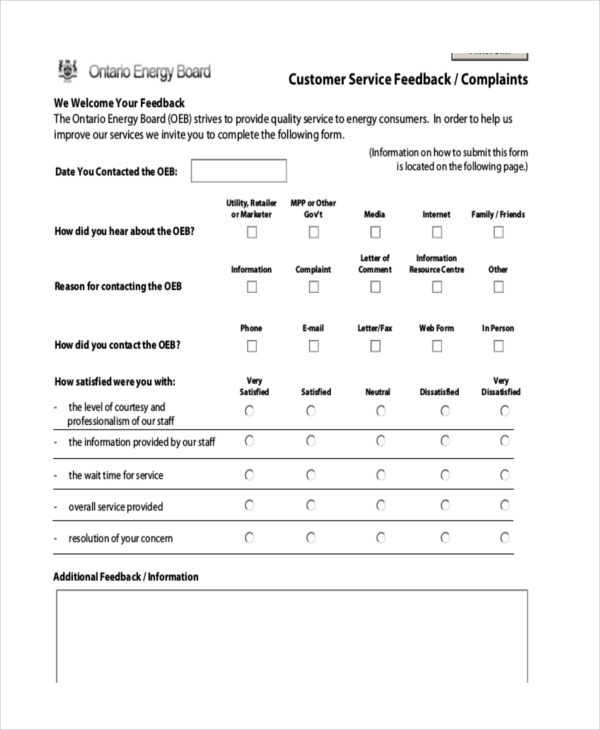 Customer feedback forms are handed out by companies so that they may understand what their customers expect from them and how these customers feel when dealing with them. 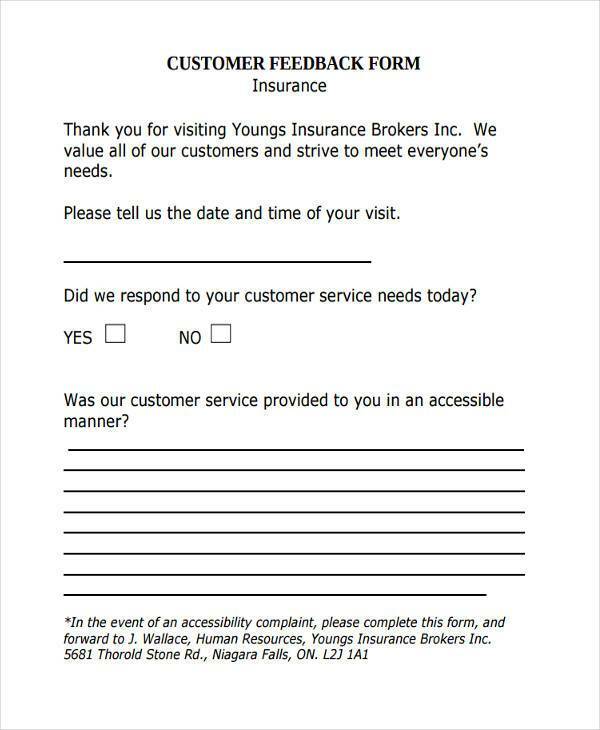 By properly assessing all the information customers have filled out in this form, businesses are able to see if there are things that could possibly be ruining their experience, as well as seeing all the things they’re happy about. All of that information is vital so that business owners can decide the best course of action to take to make sure that customers are happy and that they stay happy. This ensures that they don’t lose their customers to their competition, as well as the possibility of gaining new ones. Training Feedback Form. 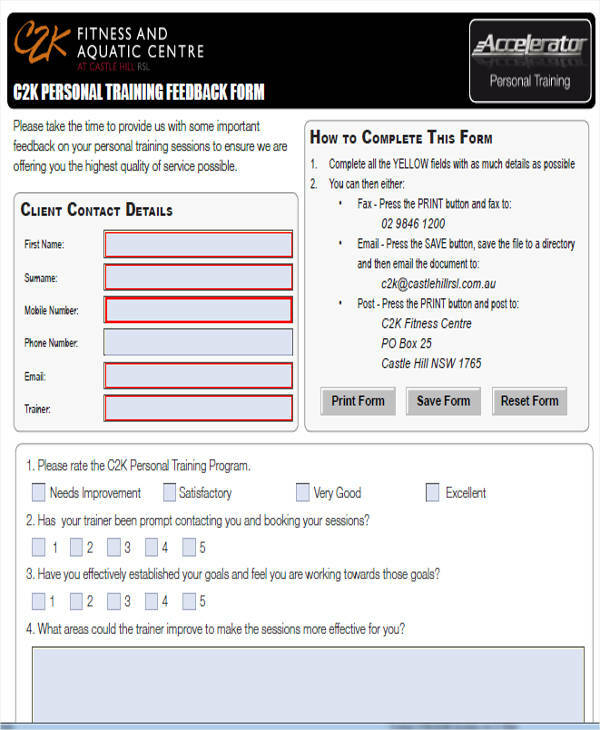 A training feedback form is specifically used by those who have undergone any kind of training session or program. 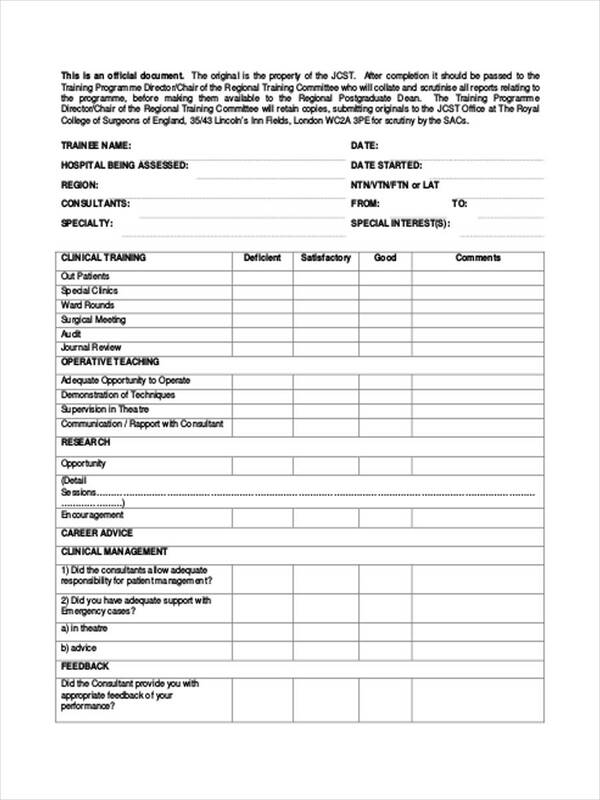 With this form, the participants may provide their comments based on the different factors that lead to the results of their training’s success or failure. 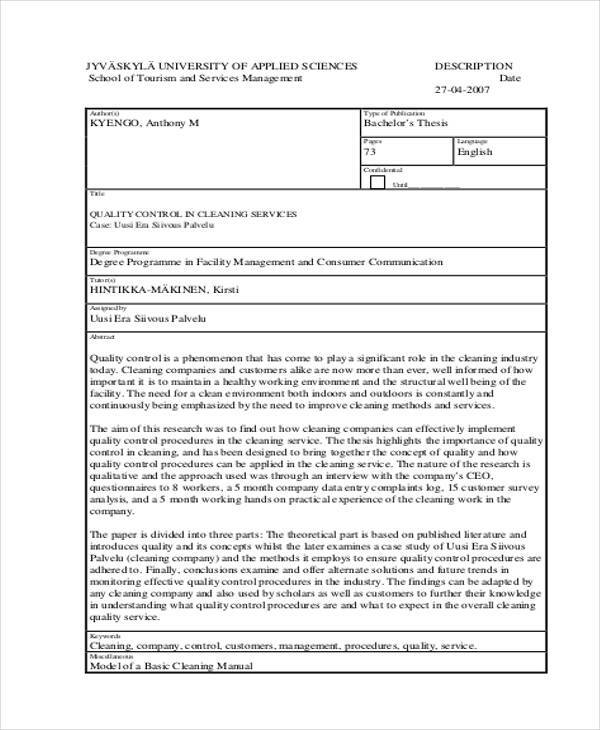 For example, a participant did not find the training method useful due to the trainer being unable to properly hand out the required information that could help develop the skills and knowledge necessary for the trainee to carry out a certain role. With this information in mind, the training session organizers can take action that should improve future training sessions. Interview Feedback Form. Interviewers heavily make use of this type of form. 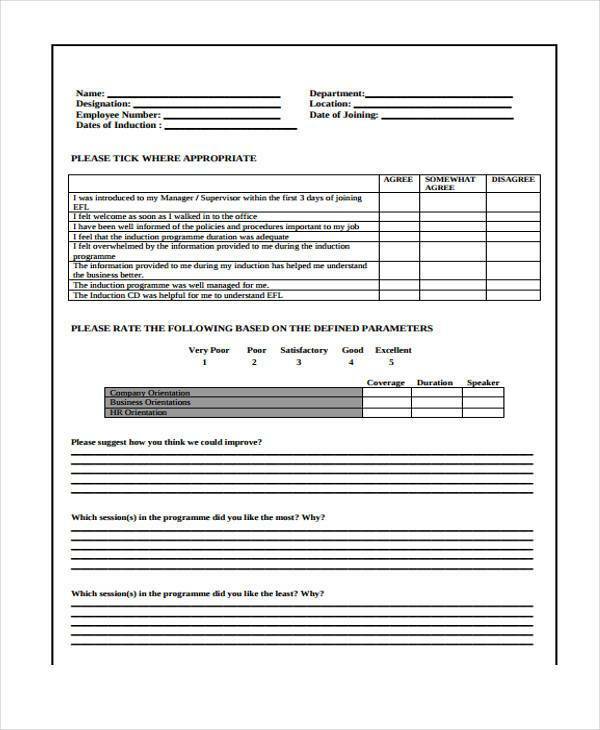 After an employer has conducted an interview with an applicant, he or she may then make use of this form to provide thoughts on how well the interview went. 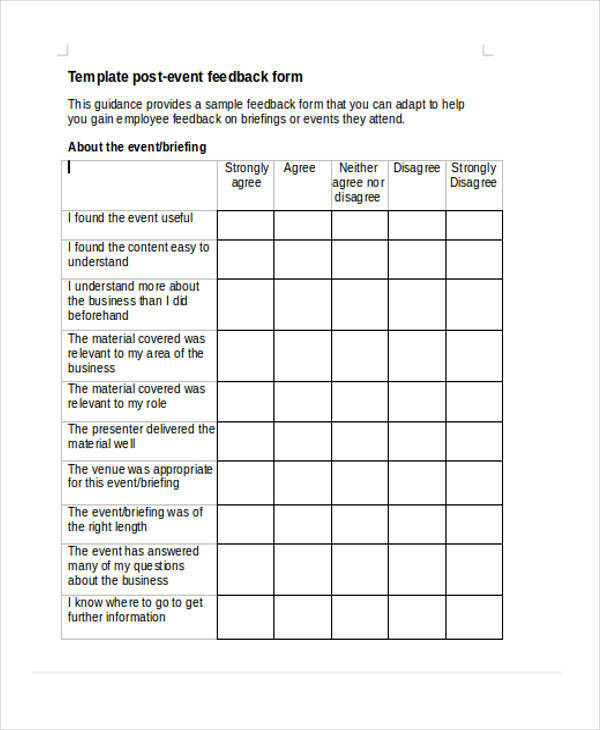 So interview feedback forms can be used to show the interviewer’s thoughts on things like how the interviewee was able to respond to certain questions, whether these responses were relevant, if the interviewee had any communication problems and so on. 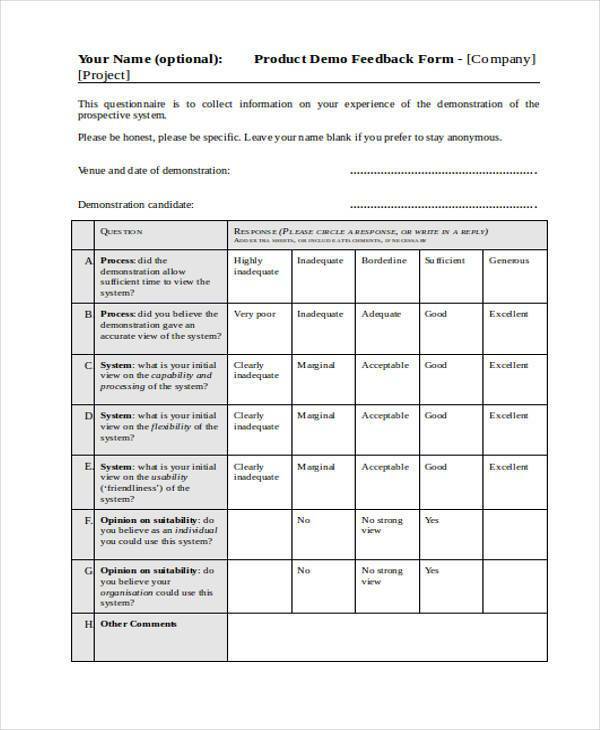 This type of form can also be handed out to the interviewee so that he or she may comment on how the employer was able to conduct the interview. Internship Feedback Form. 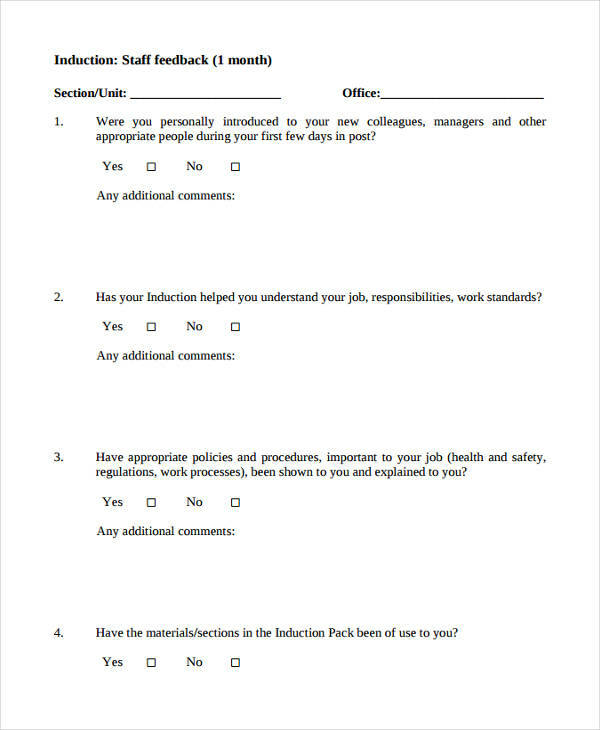 Internship feedback forms are used by businesses who have taken up interns. Interns are people who take on a certain temporary position within a company so that they may be able to understand how the company works and experience what it’s like to work in its environment. 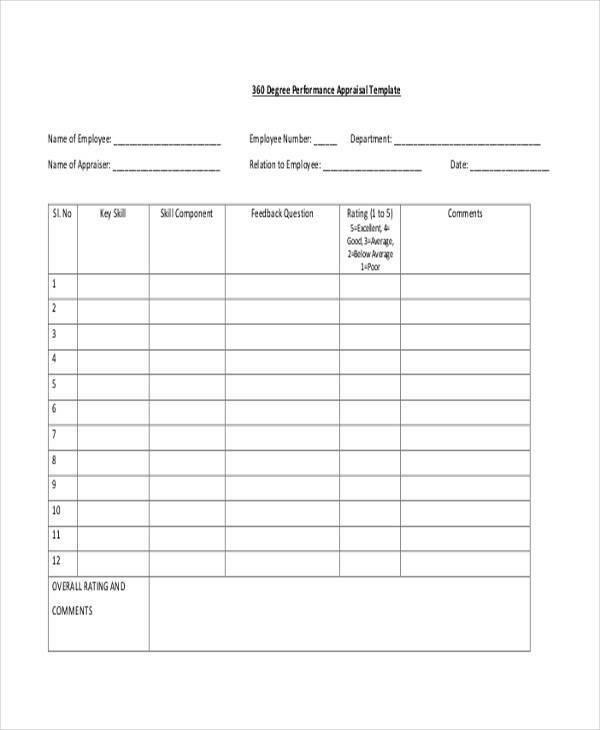 So management can then use this form to either show these interns how well they’re performing within the business or to gather information based on how the intern feels about working for the company during his or her temporary stay. Both information is equally important as one shows the intern if he or she may have a future in the business’s industry and the other shows whether the intern found the company’s business process is either great or needs improvement. Performance Feedback Form. This is the type of form that focuses specifically on one’s performance. 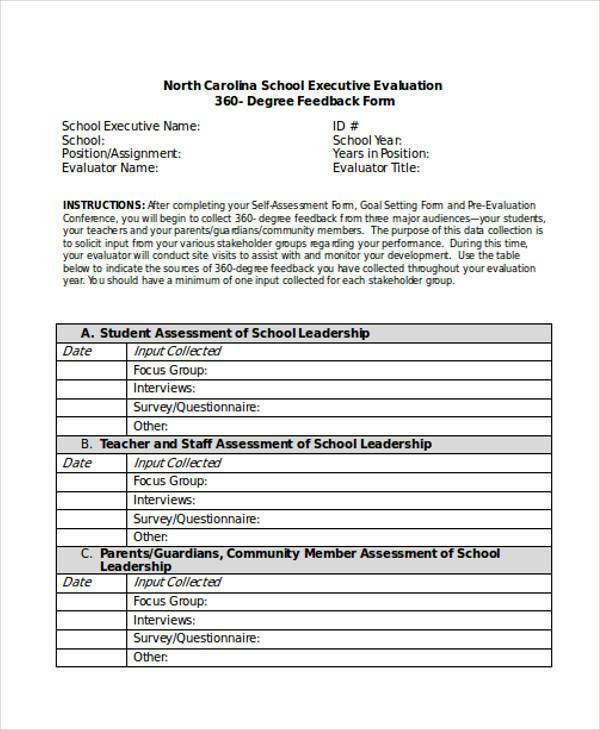 With this form, the provider of the feedback may hand out information based on how well someone is able to perform certain tasks and services. 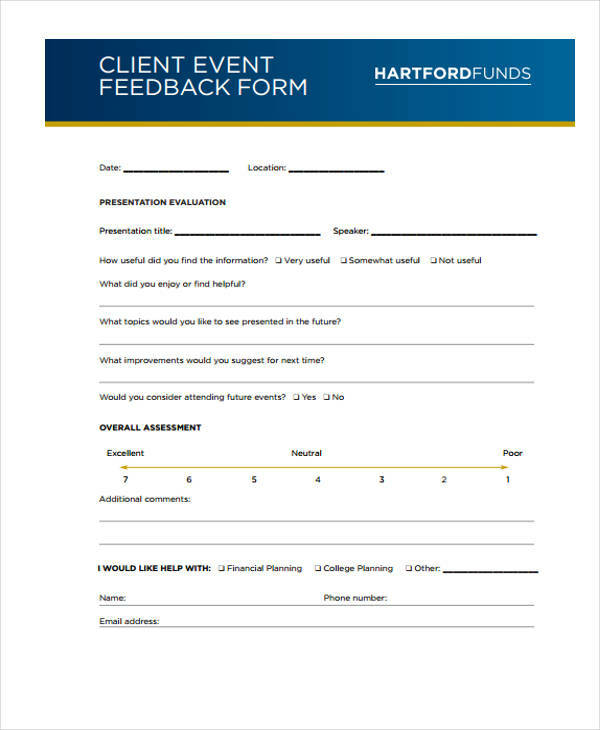 Performance feedback forms are commonly used by managers for when they have to assess how well their employees perform and provide them with information based on whether or not they’re doing well. This can easily point out the receiver of the feedback’s strengths and weaknesses and it can also provide them with suggestions as to what can be done in order for his or her performance to be improved. 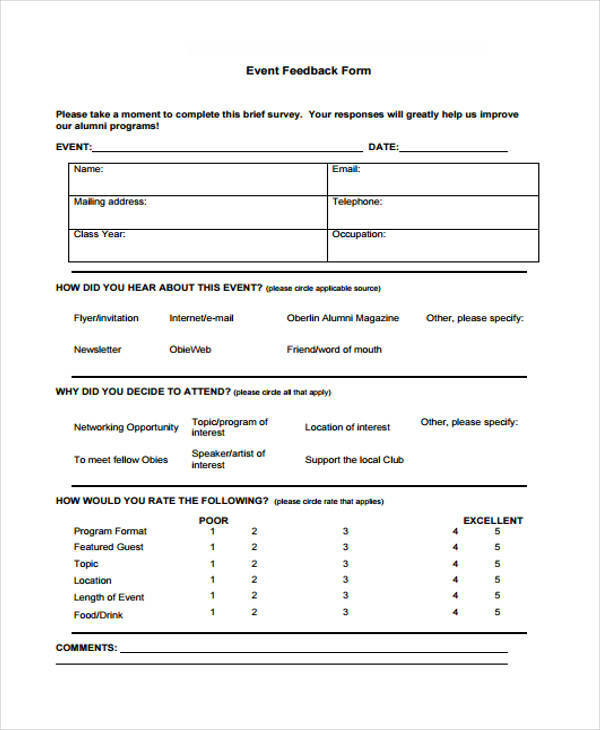 Event Feedback Form. 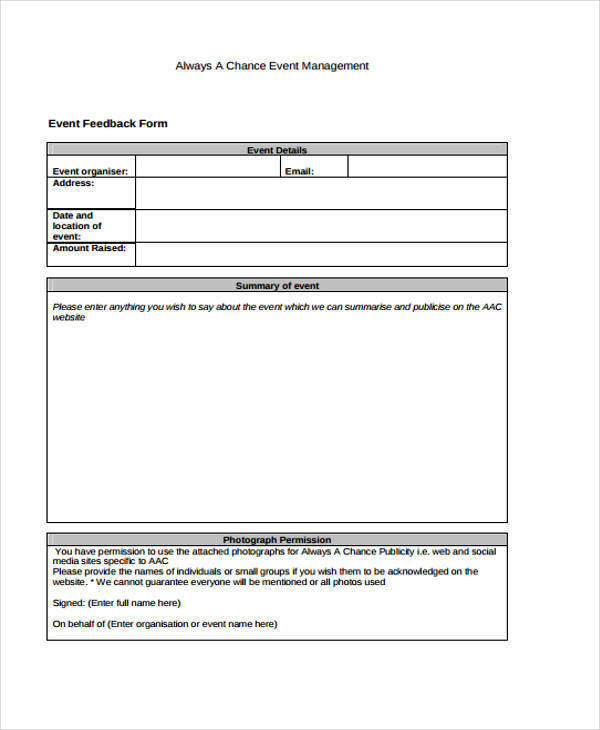 An event feedback form is specifically used by participants of the events to show whether or not they thought the event was either a success or if it did not live up to expectations. 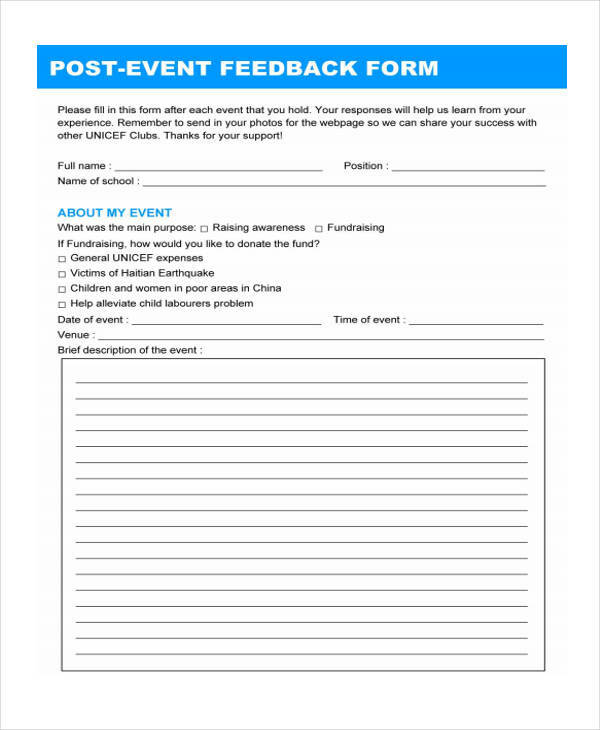 Event organizers heavily benefit from gathering the information from event feedback forms as it could tell them what went right and what went wrong. So things like the programs, the speakers, the vendors and even the location are all rated. So event organizers may then use this information to fix any problems that were encountered by the participants and to ensure that the things that went well remain consistent during future similar events they would hold. If you would like to know more about the other types of feedback forms, then you may go through our available feedback form examples available on our site.